My third week in Leonora was busy working with the school. On the Tuesday we had 8 adults and 6 children attending a LED light workshop in the studio, which myself and Dennis had prepared. On the Wednesday we prepared another 150 sheets of paper for the cyanotype print workshop, which needed to be completed in darkness. On Wednesday evening I went to the women’s group again and I brought some chicken-wire and bendable LED lights and worked with 5 women to produce their own language signs upon request, so that was fun. Dennis (my artist assistant) and I went to the school Thursday morning to work with the high school class. My proposal was to create ‘selfies’ in cyanotype- but first we needed portraits of the involved. I brought my DSLR and set up a quick/temporary studio and worked with 8 kids. Each portrait needed to be inverted and I also made some pictures posterized to create more of a ‘poster’ feel. On Friday morning, we welcomed the high school to our studio and informed the set up a system on how to produce their cyanotype images. As it is quite a direct process and easy to over expose (the image goes total dark blue) we had to work swiftly as it was a bright clear day, and the UV rays strong. Both Dennis and Istructed the high school students how to work, by placing transparency, exposure in sun and to develop in a tray of water. One of the kids, Daryl, a young fella, was initially not particularly interested, but once he saw how his own face emerged in the water process he wanted to test out and do a few more. After one+ intenses hour they had made over 75 images and we took a break having some juice, fruit and biscuits. We were discussing the exhibition and how their images would be part of it. Then we worked a little longer before the school had to go back to their classrooms. We made around 120 images with the school that included portraits and different objects and flowers. We placed the images to dry and we cleaned up the space and called it a day. That evening myself and Elaine took 2 signs out for a test arrangement / photoshoot in the landscape. We placed the signs in front of Mt Leonora just before 6.30 pm and switched the signs on- it looked wonderful! On the weekend we took Dennis and Peddilla to the forgotten for (an old mine pit) where Dennis used to go swimming as a child. We then headed over to Malcolm Dam, which was stunning with lots of flowers and water. We had a picnic and went for a walk. I did some sound recordings in the water. Before heading back to Leonora we climbed Malcolm hill in 37 degree heat having a look at the wonderful view. That afternoon I spent visiting Talitha and Roderick and we made some more cyanoprints in their garden. Their two daughters were running around playing with the newly arrived duck, which was little, fluffy and yellow. Sunday afternoon myself and Elaine headed out to lake Raeside to do some filming. I was searching for a location with a red dirt road for some performative works, which I often engaged in through various locations around the globe. I wanted to do a large-scale print / painting using the landscape and the colours available for imprint. We used Elaine’s car but I also dressed up in one of my ‘characters’ wearing a spell dress and a mask as part of the performance / action. It’s a direct engagement through vehicle and body physically dragging around a huge sheet (7 mtrs) fabric. The residue shapes the print. 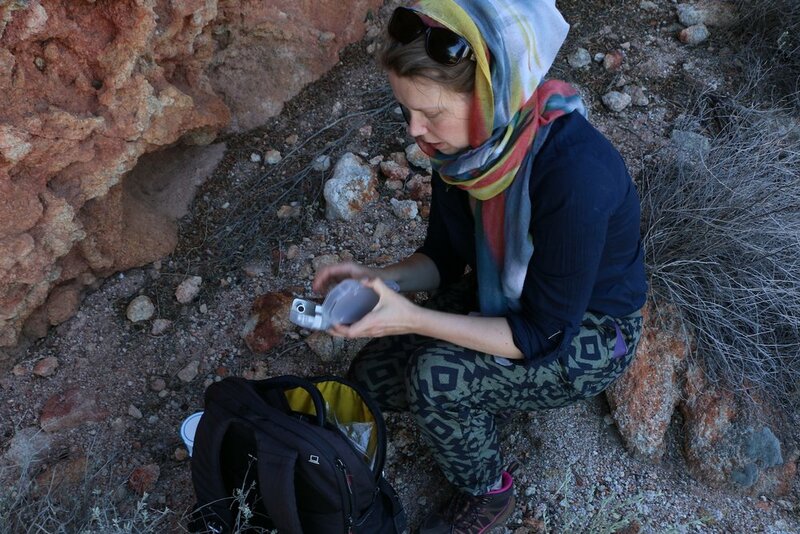 I set up my camera and asked Elaine to shoot whilst I entered the Salt Lake with the fabric and then dragged it across the landscape, picking up dirt and pebbles, becoming crystallized because of the saltwater on the fabric. Elaine was very supportive and thought it was great fun- as it is quite a crazy activity that I often just do by myself. Last week - lots to do. Monday morning I was interviewed by Spirit radio that was broadcast on Wednesday, the day before my light event. Then the ABC Goldfields and Esperance team contacted me as they saw one of my test images of a couple of signs out by Mt Leonora on the Leonora grapevine, facebook group page. They wanted to come out to the event and film it as they thought it looked so great. I headed to the studio to meet with Dennis. We worked on assembling more of the signs and I left him and Peddilla to be in charge whilst I worked on the invite and marketing with Elaine. We sent out all the invites that afternoon. Monday evening Elaine had arranged a dinner for some of the people in Leonora, which was lovely. Elaine told them about our fabric mud race and I am not sure what they made of it except laughing about it. Elaine had also just finished a huge restoration on the mining head frame that very day (Monday) so lots of things happened at once. Tuesday myself and Elaine went to check on the cottage in Gwalia where we wanted to hang all the cyanotype prints made with the community. The days were getting hotter and we found out that the event day on Thursday was supposed to be 42 degrees with high winds. Damn! Back to the Shire we went to organise chairs for the event and sand bags for all the signs. We also arranged catering of sandwiches and nibbles and we had Talitha to make her famous cakes. Wednesday took up most of the day of finishing off the signs, pack everything for the event such as tools and lights, cups and plates etc. We had an early evening as we had to go up at 5.30 am to start installing the cyanotype in the cottages- as by 11 am it would already be 35 degrees meaning 45 inside the cottages. I installed the lights with the help of Elaine. We then moved onto the fabrics and started to pin up the somewhat 150 pieces of cyanotype. Not so easy as the warm desert winds were picking up. I wanted to interview Dennis and we had arranged for this to happen this morning too. The ABC called and said they would be coming around 3.30pm. So it was just go-go. Driving out into the landscape myself and Dennis talked for about 25 minutes in hot weather. Back home we both noticed we were orange because of the high winds, desert sand onto sweaty skin. Shower. Food. Water. Get changed. Meet with ABC- interview at 4pm for 20 min inside the cottage at around 42 degrees outside- probably 47 inside. Very hot. Back to the studio to meet Roderick who also work for the Shire. Picking up all the signs whilst the ABC is filming. Heading out to the Mt Leonora / Dingo Dreaming to install the signs. I asked the ABC to interview Dennis too, as he is from Leonora and he has come back to work with youths and had recently set up basketball activities Mondays and Wednesdays. Arranging signs, sandbags and chairs. Elaine head to pick up esky with water and juice, cakes and catering stuff- we are now heading towards 5.45pm. There is a meeting in town on community awareness on suicide that finished at 6pm. We decided that this art event would complement this quite well as a positive and fun event and asked the Shire if they could arrange a bus service out to Mt Leonora for easy access- as people wouldn’t walk 1,5 km in 42 degrees heat. So, at 6.20pm a busload came full of people, that is 40 in total. Great. The bus left and came back with a second load, oh, another 40 people, then individual cars started to drive in. O.K now I was getting nervous, called Elaine and said we filled our estimate twice already! The ABC was gobsmacked, Laura the reporter said that this is amazing. Then Jim Epis the CEO and the Shire president arrived with their families. It was just amazing. We started at 7pm on the dot. Elaine did an introduction, I spoke briefly and Dennis spoke thanking the Elders for allowing us to use their land (the site is significant and we were allowed to place the signs in front of the Dingo Dreaming). Then we invited all participants who had made signs up to switch on their signs. And people loved it. There were tears and laughs and everyone wondered around asking what this meant and what that meant- as the languages were not only in English, but in many languages. On Jim Epis’ instruction, we left the signs on all night so people could see them driving past. We then headed to the cottages for food and to see the prints. It was a thoroughly enjoyable evening and everyone was very impressed and happy. We were told that over 100 people attended. The signs were picked up Friday morning and donated to the school. I also gave lots of their prints to decorate the school rooms with. A sad walk around saying goodbye to people. 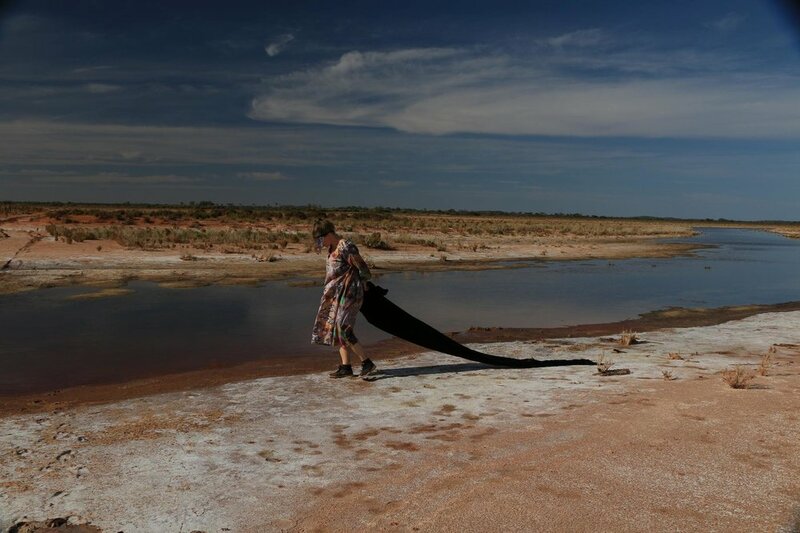 In the afternoon myself and Elaine took a trip to lake Horan and Raeside salt lake to do a second filming on my performative salt lake painting, using some of the black fabric. It was a beautiful day and a nice way to end. 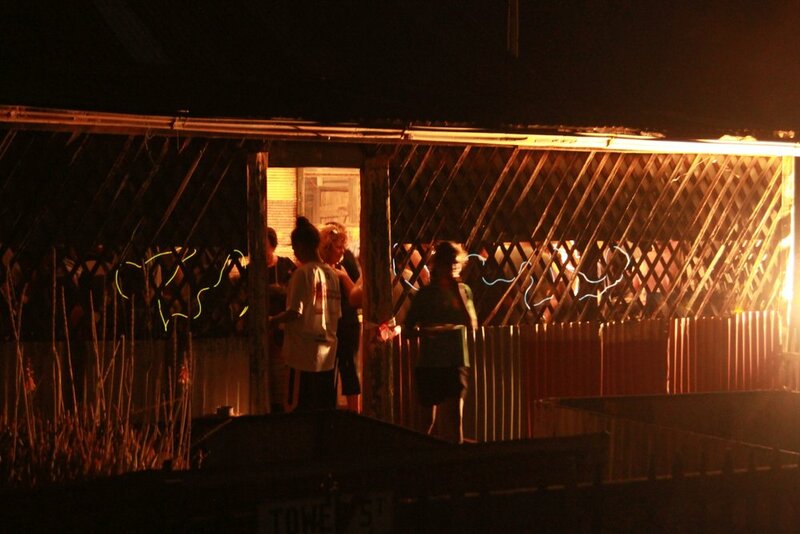 That evening at dinner, we were approached by several people, who complemented the light project. They loved it. We both got hugs and it was emotional, feeling that this community really appreciated all that work. Saturday, we headed to Kalgoorlie as I was flying out to Perth on Sunday morning. We went to have lunch with Geraldine and Luxie who were staying in Kalgoorile. It was very nice to be able to see them. I love these women and see them as family. It was lovely to hang out, but very sad to leave them, we all cried. I brought some bendable LED lights so Luxie could get a sense of what we had done. We then decided to ‘pimp’ her walking frame in yellow LED. So she can turn it on when she fancies a bit of light. They had a painting with a story telling made for me and it will be sent to me in the post. I will see them again. I am certain. That evening Elaine and I had dinner out, just to catch our breaths. Sunday I was dropped at the airport and we parted ways. Again, we will be in touch as we have become good friends, learning a lot from each other. On Monday morning, I headed to Adelaide to interview Donna Reid who lived in Leonora 1970’s for 11 years, and who was the founder of Gwalia Museum. She is an artist who followed her husband Don Reid to work in the Goldfields as an engineer geologist, straight from her home in Nebraska where they met. She was very involved in rescuing Gwalia, stopping the demolition of cottages and managed to ensure it was seen as a valuable heritage asset, that should be kept. 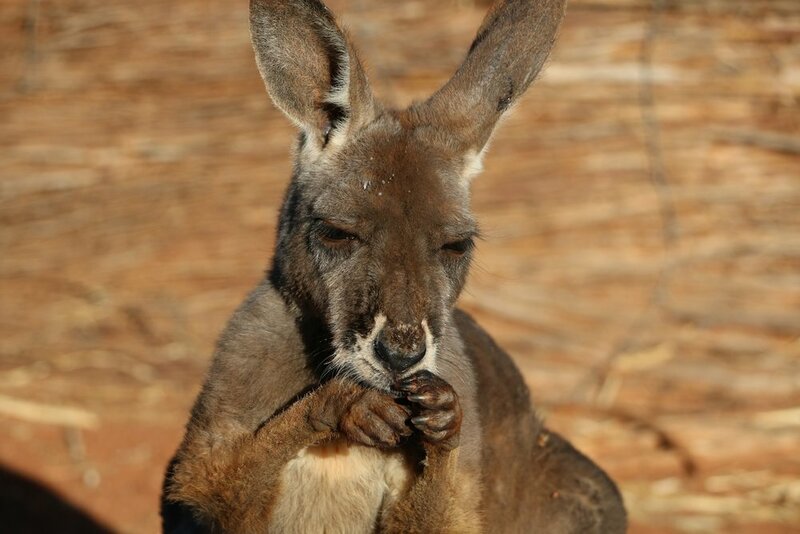 Today Gwalia is probably Leonora’s best tourist attraction, after gold prospecting. A heritage site important to the Goldfields and something Elaine is also working on; restoring Gwalia museum and archives. I have hours of footage and interviews with Donna from my 2 days with her. The extent of her artistic practice is inspired by Gwalia and mining woodwork patterns. This will become a short film on the history of Gwalia from an artist perspective of heritage and history. My contribution to Donna’s work is a stop motion animation from some of her objects left behind in Gwalia museum. This film / animation will be donated to the Shire and the museum, and could feature as an addition to the other information around the museum history, to not forget why Gwalia is still there (without Donna, Gwalia wouldn’t be there). I am also intending to use my encounter with Donna for the final spaced 3: north by southeast exhibition in 2018, as she is the core inspiration from my encounter with Gwalia. I feel like I have traced her footsteps, only 40 years apart. After 8991 miles, I arrived in a cold 14 degrees Perth on the 3rd October, after leaving Europe with around 20 degree Celsius. I didn’t sleep much on the plane but was making sure to arrive back in Leonora with some energy and my jetlag behind me. 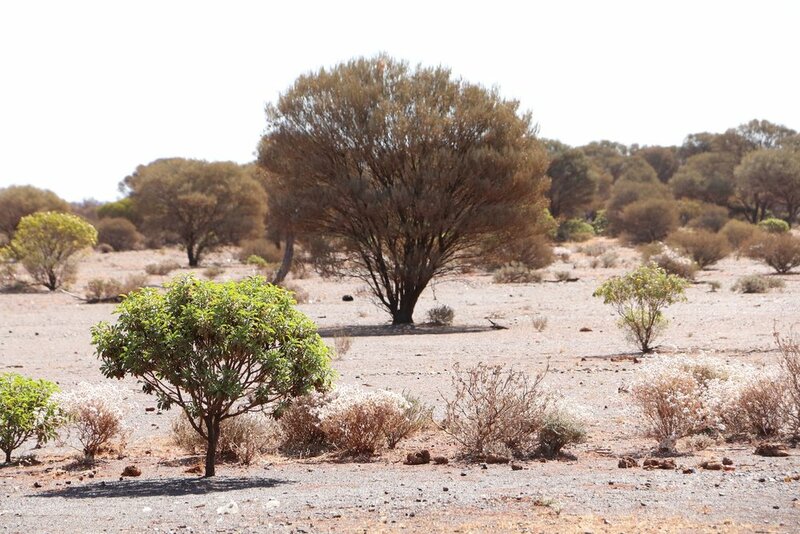 Like many outback places it is far and distant to anything. Whilst in Perth I decided to book in for a hot bamboo massage and yoga (I don’t usually indulge, but it was so worth it) and it surely drove the jetlag out of my body. Over 5 days with various meetings with IAS and my Aboriginal Cultural advisor Ron Bradfield Jnr., as well as revisits with old friends and a chance to go to the Pinnacles and Lancelin sand dunes I finally arrived in Kalgoorlie on Sunday 8th October. Elaine Labuschagne from the Shire of Leonora and my host for the project picked me up at the airport. Now a 3-hour drive awaited us through the red desert landscape. 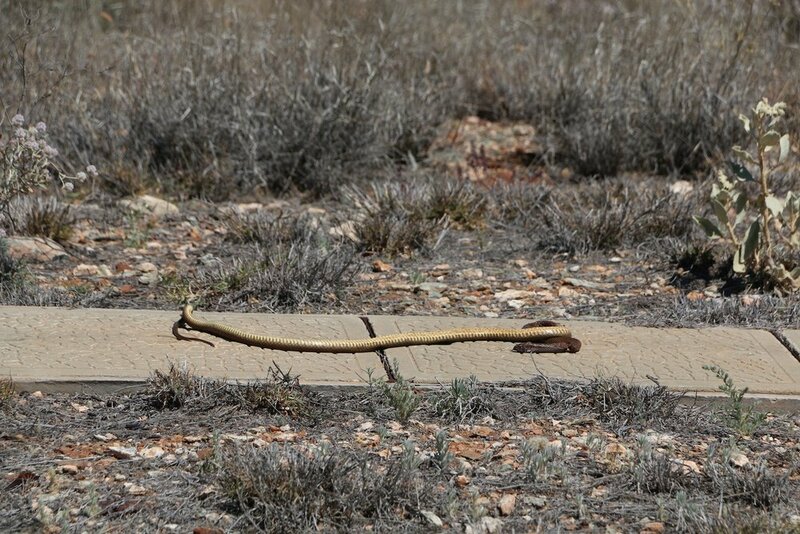 The road was littered with road kill such as kangaroos, cows and the odd lizard/goanna. The heat is already getting beyond comfortable of 35 degrees, what did I complain about in Perth? Elaine and I became close friends in my last trip to Leonora, so we had lots to catch up on. Elaine is the Heritage Manager in Leonora, responsible for the large locale that is the Leonora Shire, and in particular for the Gwalia ghost town and former mine preservation. She arrived in Leonora 4 years ago, herself being a native South African. Whilst I was in Leonora last year she was in the process of organising a display of the local Wongatha woman Geraldine Hogarth’s OBE award for life-long work in hearing health and language, which I was included in to materialise. This gave me a closer understanding and exchange with Geraldine and her mother Luxie, who I very much was looking forward to seeing again. So upon arrival we quickly arranged a dinner and I cooked roasted chicken with veggies and a Swedish style apple crumble. It was wonderful to see them again and despite Luxie having become a bit frail with hip problems we laughed throughout the evening. All I can say is that I love these women. The first week in Leonora included a re-acquaintance with the school, the youth centre and its new employee Rene Reddingius Jnr., the Medec centre, alongside arranging to move into a space where I could work for the next 4 weeks - the old Community Resource Centre (which had moved to a new flashy building elsewhere in Leonora together with many other business and organisations). It is great that the Shire made sure I could have such a central space to work in as it makes it easier for people to come and find me even though Leonora is small, only one short high street. On the Wednesday I attended the Women’s group with Elaine where we learnt basket weaving from a lovely woman called Leonie, a new temporary teacher at the school. That first weekend I was invited to go to Sandstone with Elaine to attend a meeting of museums in the area and the opening of the Sandstone WW1 exhibition Remembering Them, which celebrated Marge Landy’s work in Sandstone over the last 8 years. I will come back to Sandstone later, but my initial perception of this little town was filled with eeriness, despite lovely company. The town only has 53 inhabitants but a brand new observatory- and my oh my, were the stars bright out there! We could very clearly see the Milky Way. On our way back Elaine took me to see the famous ‘London Bridge’ and the brewery in a cave on Sandstone heritage trail. We then drove through to an old mining village called Agnew, now a ghost town, onto Leinster, a small town built in 1976, where we stopped for a lovely lunch. Back in Leonora hitting week 2 we arranged a meet and greet in the CRC building (my studio) for Tuesday 17th October. It was a very successful introduction of this 2nd stage of my spaced 3: north by southeast project with 23 adults and around the 15-20 children popping in and out. It was a great mix of people both of Aboriginal heritage (such as Geraldine and Luxie) but also some new faces like Vicky Abdullah and TomTom (Dennis) Simmons, my artist assistant to be, and many from the community, even some new arrivals. I made a large roasted pumpkin and chickpea salad and a pasta salad with apple cake and kärleks mums (love nom noms) and introduced my light and language project using bendable LED lights to create a large-scale outdoor installation, and the cyanotype printing technique using UV rays and water as its components, to make an image and develop it, I wanted to deliver a visible, fun and thoughtful project for Leonora that sits between dark and light, light and shadow, the visible and invisible. By merging new and old technologies my project also engages with thinking about circularity in cultures and how things on the verge of disappearing can become illuminated and brought back. In the language project we will have four Kuwarra words noting North, East, West and South and in-between these we will try and tease out less colonial languages (English) and try to consider heritage both as indigenous and as immigrant through layers of time. Hopefully we will be able to see the breadth of languages within Leonora, still simmering underneath the English. Following the meet and greet I have organised a few workshops and started working with TomTom my assistant for the remainder of my stay. TomTom is a young Aboriginal man and a great asset to have onboard. We made all the wooden structures together with help from Gerrit, Elaine’s husband. Tomorrow (Tuesday 24th October) we are holding a light /language workshop from 3pm-8pm. On the weekend I held a workshop between 2-5pm but it was pretty quiet due to the local election, 37 degrees and car boot trail… a bit of a collision. On Sunday Elaine and I went out bush. We headed to the Terraces / Breakaways and to Lake Raeside, a nearby salt lake. We drove through a big thunderstorm. It was great to get out. Today (Monday) I have been filming Donna Reid’s painted objects in Gwalia Museum. I am attempting a stop frame animation series that will accompany my interview with Donna who now lives in Adelaide, and to who I am visiting after my stay in Leonora. Donna lived here in the 1970’s and stayed for 12 years after arriving from Nebraska. She and her husband set up the Gwalia Museum and initiated that as a wonderful preservation of different times of immigration in Australia. I am trying to lay bare the difficulties of working on the ground with no local arts centre in a community that is quite jarring, but simultaneously a place where change could really happen if…If. This week is jammed packed and hopefully I get to go out bush with Geraldine and Luxie as we spoke about on Wednesday. I arrived in the Goldfields. I am very jetlagged. The town Leonora is quite small with around 650 inhabitants. It was much colder than normal for this time of year and I was glad I brought my coat. When I arrived at my accommodation it was clear that no one had been staying there for a while. There were mice droppings around and in the microwave an old baby bottle in which milk was turning into a new life form. I guess I didn’t know what to expect, and for sure I did not expect luxury. But my stay in the flat only lasted for a few hours as a pipe in the adjacent kindergarten had burst and flooded the place, which meant there wouldn’t have been any running water for one or more weeks. After one night with not much sleep, I strolled over to the ‘living’ museum just outside town, an early mining settlement called Gwalia, now a heritage ghost town. After making acquaintance with the Shire and its staff I was offered to stay with one of their employees who had a spare room. To get me familiar with the youths and their activities, my Aboriginal hosts took me straight to run a workshop in a youth club. Being out in the sticks, the material for the planned tie dye workshop hadn’t turned up. So with 8 kids hanging around I went to the local shop and purchased vinegar, red cabbage, red onion and turmeric for making our own dye. It worked a treat and the kids ended up tasting cabbage and later using its colour to dye their t-shirts. Working with the children allowed me to make acquaintance with some their parents. And the other day a family of five took me out for a ride to see some of the closed goldmines and some creeks. I learned a lot from their knowledge of their surroundings such as how to find gold and differentiate between fool’s gold, real gold, silver and platinum. One of the old open pits has had a lot of ground water seeping up through it and the kids told me they go swimming there. Over the next few weeks I hope to do a few more workshops and get to know the whole community, and hopefully get to ‘go bush’, as they call it. I want to make myself aware of my Aboriginal host family’s traditions, the Ngalia language and their embodied relation to the surrounding landscape. We have discussed developing a cultural exchange to enhance awareness of the peripheral and its relation to mining, production, technology and at the same time try and keep the sacred secret and nurture respect for the landscape and first nation people. I know I have a lot to learn.